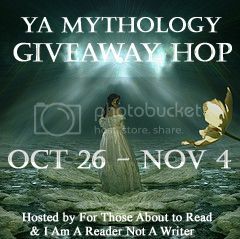 Welcome to my Mythology Giveaway for the Hop hosted by For Those About to Read and I am a Reader Not a Writer. Go to either of their blogs to see who else is participating, and enter to win great books about mythology! 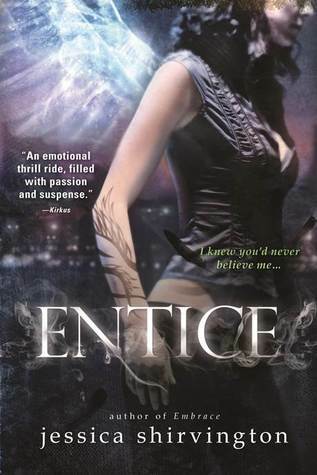 For my giveaway, I am giving away an ARC of ENTICE by Jessica Shirvington. This is the second book in the Violet Eden Chapters, and revolves around angel mythology. This giveaway is USA only. The war between Exiles and Angels is on — and she's wanted by both sides. The hotly anticipated follow-up to Embrace, Entice ramps up the captivating combination of angel mythology, forbidden romance and intense action. Seventeen-year-old Violet Eden's whole life changed when she discovered she is Grigori – part angel, part human. Her destiny is to protect humans from the vengeance of exiled angels. Knowing who to trust is key, but when Grigori reinforcements arrive, it becomes clear everyone is hiding something - even her partner, Lincoln. And now Violet has to learn to live with her feelings for him while they work together to stay alive and stop the exiles from discovering the key to destroy all Grigori. It isn't easy. Especially when the electricity between her and exile Phoenix ignites, and she discovers his hold over her has become more dangerous than ever. The race halfway across the world to find the one artifact that could tilt the balance of power between Angels and Exiles brings them to the cradle of civilization, where Violet's power will be pushed to the extreme. And the ultimate betrayal exposed. Thank you for this amazing giveaway! I just recently bought and read Embrace and can't wait to read Entice! I just know the sequel will be just as amazing as Embrace was! Thank you for the chance to win! Thank you for this awesome giveaway. I have read Remembrance and I loved it.